The mission: Get MythTV to change channels on my Cable provided STB (Set Top Box). I connected a coax cable from the STB to my caputre card, but with an STB one cannot tune/change stations using the tuner built into the capture card. The capture card should remain on channel 3, and I need an Infra Red emitter to send signals to my set top box when Myth needs to change channels. * [http://www.irblaster.info/ irblaster.info] - $12 - $15 - inexpensive serial IR blaster similar to what you might build yourself. You stick it with included double sided tape right to the STB pointing at the STB's IR reciever. * [http://www.irblaster.info/ irblaster.info] - $12 - $15 - inexpensive serial IR blaster similar to what you might build yourself. [http://www.irblaster.info/ I used this one.] You stick it with included double sided tape right to the STB pointing at the STB's IR reciever. * [[MCE_Remote|Microsoft MCE USB remote combo]] - A usb remote and blaster combo. Works very well. 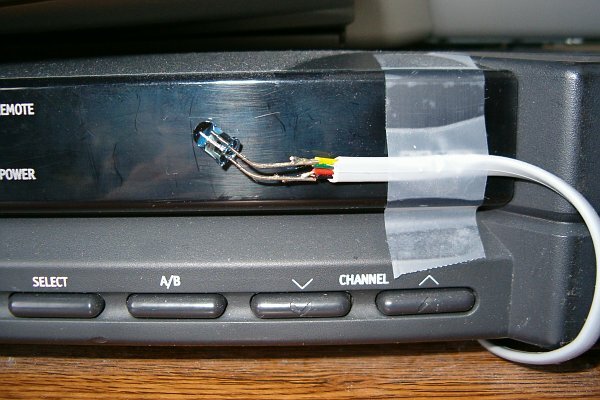 * DIY - with parts from Radio Shack. Wish I had a good link! * [http://www.commandir.com/ CommandIR Mini] - A hardware-based USB transceiver supporting multiple IR blasters or "emitters". Can simultaneously control set top boxes and receive remote control commands. Provides a free online MythTV support [http://http://commandir.com/content/view/42/63/index.html Mythtv]. [http://www.eggshellskull.com/index.php Andy's HOWTO] is the easiest to follow, but is Fedora specific. It says Fedora Core 3, however I have used it on Fedora Core 4, and it should work for most Fedorae. It expects that Myth has been setup according to Jarod Wilson's Guide. This HOWTO is not Fedora specific, but requires recompiling LIRC. If you have a Hauppauge PVR-150, it may include a built-in IR output capability. See [[Hauppauge PVR-150]]. You have to load lirc_serial at boot. There are instructions in the HOWto links. The way I do it on Fedora is to edit modprobe.conf. Since you likely also have an IR receiver, such as on the Hauppauge cards, you need two lirc modules loaded, the lirc_i2c module for the IR receiver, and lirc_serial for the IR emitter. Again please see the details instructions in the links above. Instructions in the HOWTO links show you how to make a [[LircChannelChanger|channel change script]]. You need to use MythTV setup to tell Myth to use the script to change channels. '''Note: You can get MythTV 0.20 to send out channel numbers as the parameter. First, get EPG working. Then using, mythtvsetup, channel-editor, remove all your channels. To add the channels again, this time, instead of scanning for channels, get the channel list from the epg service and readd those channels. *do not* be tempted to change the configure options to set COM1/IRQ4 in the pre-make configuration. Rather, follow the directions and pass those options through /etc/modules.conf or /etc/modprobe.d/aliases. Changing the settings at the earlier stage will produce a module that conflicts with the standard lirc (and a frustrating string of errors in [[dmesg]]: ledxmit_dev: register_chrdev failed ledxmit_serial: Unknown symbol ledxmit_register_plugin). Refer to [[Set-Top_Box_(STB)_Status|this page]] for help to setup a STB monitoring script. For best results, make your channel changer script first call this, so that it gets unhindered read access to your ivtv device. [http://mythblasterz.gotdns.com/ Mythblasterz] offer an inexpensive IR blaster with 5+ meter range. *[http://stores.ebay.com/LIRC-and-MythTV-Store LIRC/MythTV] EBay store with interesting IR blaster options. There are some kits for building your own IR transmitters. *[http://dangerousprototypes.com/docs/USB_Infrared_Toy USB Infrared Toy] USA, Germany and Europe stores. Works with LIRC 0.9.3a. Receives and sends IR signals. [http://www.mytvstore.com/ MyTVStore] sells the MyBlaster products. [http://www.iguanaworks.net/ir/ IguanaWorks] also sell IR blasters. [http://www.commandir.com/mini/settopboxcontrol/ CommandIR] sells a hardware-based USB multi-blaster. Available in Canada and the US. *[http://www.commandir.com/ CommandIR Mini] is a hardware-based USB multi-blaster supporting independent control of multiple devices via "emitters". Device receives & blasts simultaneously and they ship globally. *[http://www.redremote.co.uk/serial/ RedEyeRemote] They don't look much, but these IR transmitters work via serial port with NTL PACE and Samsung STBs. 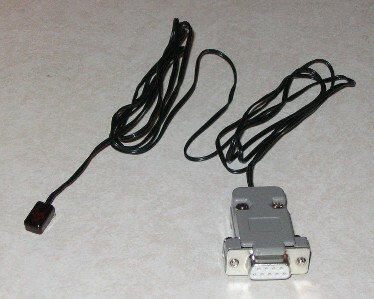 *[http://www.dusky-control.com/ DuskyControl] This is a USB device which connects to the RF2 port on your Sky or Sky+ box. There is a version with dual outputs to allow control of two boxes. [http://www.redremote.co.uk/serial/ RedEyeRemote] They don't look much, but these IR transmitters work via serial port with NTL PACE and Samsung STBs. [http://www.eggshellskull.com/index.php Andy's HOWTO] is the easiest to follow, but is Fedora specific. *[http://www.eggshellskull.com/index.php Andy's HOWTO] is the easiest to follow, but is Fedora specific. *[http://losdos.dyndns.org:8080/public/mythtv-info/IR-BLASTER-HOWTO.html IR BLASTER HOWTO] with a [http://mirror.mmdsi.com/losdos.dyndns.org/public/mythtv-info/IR-BLASTER-HOWTO.html mirror]. This HOWTO is not Fedora specific, but requires recompiling LIRC. This page was last modified on 28 October 2017, at 07:09.